The creative wonks at Disney must know they take their lives in their hands every time they remake one of their classics. Though Dumbo is perhaps less watched and less loved these days than the likes of Snow White and Cinderella, it’s a special film in its own way, and was Walt Disney’s personal favourite. Perhaps that’s because the 1941 animation saved the studio from bankruptcy after the box offices failures of Fantasia and Pinocchio. Barely 60 minutes long, it told the touching, by times heartbreaking, and ultimately uplifting story of a baby circus elephant born with ginormous ears. Children in their droves were traumatised by the scene in which young Dumbo is separated from his mother after she knocks the big top down while defending him. She’s declared mad and locked up, and when her child comes to visit her, their trunks mingle through the bars of a cage. Weepy stuff, but Dumbo’s outsize lugs have a hidden purpose, because they allow him to fly. In the original film, the juvenile pachyderm was assisted by a faithful mouse called Timothy, and a wily gang of crows who would later come to be considered distasteful African-American caricatures. This, though, is a live action film, so a talking mouse who sounded like he was from Brooklyn was deemed beyond the pale. In fairness, this production is not so much a remake as a rethink: it has departed considerably from the original template, as evidenced by the choice of director. Tim Burton was always going to introduce his well-worn gothic tics to the equation, and once this warm and fuzzy family drama is up and running, its corners are curled by a Halloween-ish tinge. Colin Farrell leads the line, playing Holt Farrier, a one-time big top horse-riding star who returns home to the circus from the Great War disillusioned and physically diminished, having lost an arm. His two young children Milly and Joe (Nico Parker, Finley Hobbins) are shocked when they see this, but they’ve already known plenty of grief, their beloved mother having died of influenza when Holt was at war. He hopes the circus owner and ringmaster Max Medici (Danny DeVito) will let him perform again, but Max is a realist, and asks Holt to look after the elephants instead. When one of them gives birth, Max thinks things are finally looking up for the circus, which has been going through hard times. But when he gets a load of Dumbo, all bets are off. The pup is a freak, he decides, and must be kept out of sight: little does he know that Dumbo can fly. Milly and Joe are playing with the animal when it ingests a feather, and takes off. Their attempts to introduce Dumbo to the circus-going public hit the headlines, and next thing you know the vultures are swooping, chief among them V.A. Vandevere (Michael Keaton), an oily entertainment mogul and owner of a vast amusement park. When Vandevere offers to buy up the whole Medici Brothers circus, Max agrees, and off they’re whisked to the bright lights of New York. It’s Vandevere’s plan that his star trapeze artist Colette Marchant will ride Dumbo as he flies, but the animal is not keen to cooperate, especially when it finds out that its mother is being held nearby. 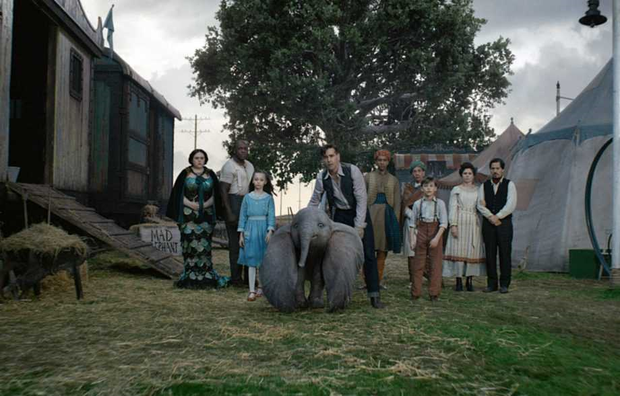 The critical welcome has not been warm for Mr. Burton’s Dumbo, with the Guardian’s Peter Bradshaw awarding it a solitary star. This seems churlish, because while it’s true that the film’s disparate parts never fully coalesce, and that Tim Burton might not have been the ideal choice as director in the first place, there’s enough humour, heart and visual panache to keep you interested. The CGI elephant itself, which has been the target of particular ire, is pretty well rendered in my opinion, cute but not too cute, with watchful blue eyes and an impish streak, and the first sight of it taking flight is strangely moving. Colin Farrell brings his usual soul to a slightly underwritten role, and there’s an interesting chemistry between he and Eva Green. Michael Keaton is great fun as the stylishly odious Vandevere, and as is his wont Danny DeVito gives it socks as the irrepressible ringmaster Medici. There is, it’s true, a slightness to all these characterisations, and it’s the actors rather than the script that give them such depth as they possess. Perhaps this is because the filmmakers, too afraid of dropping the ball, have played it safe. There are constant studious nods to the original cartoon, but in the end your heartstrings are not tugged as they might and should have been.